The role of Clement Scott in the story of the Cromer-Overstrand area is well established. He came to the area early in the summer of 1883, produced his first article about the region for the Daily Telelgraph, and went on to make the most of the inspiration he could gain from the area to produce many column inches, the text later often reprinted in book form. Today his verses are not regarded as the finest poetry of his era and many certainly come close to matching the melodrama of those by his contemporary George Sims. Both produced poems intended for reading aloud; magic lantern producers delighted in producing pictures to go with the verses. Having said that the verses don't place him in the top rank, that was not the view of his public. Arguably he can be said to be the most popular poet of his time. 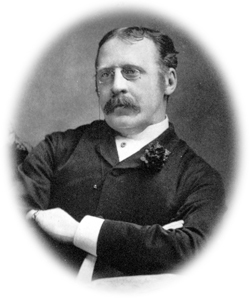 He was a regular contributor to Punch magazine, where editor Frank Burnand backed and maintained that popularity. The subject of his verses ranged far and wide, often responding to incidents reported in the national press. In the context of these pages, we must restrict our selection to those with a Norfolk and Cromer connection, sometimes suggested, sometimes overt. The best of his verse was brought together in Lays and Lyrics published by George Routledge and Sons in 1888, in a series that numbered Dickens, Thackaray and Wendell Holmes amongst its other contributors. 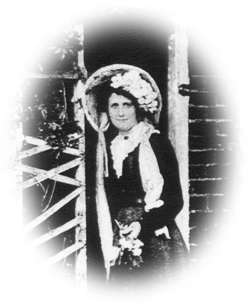 If you'd like to more about Clement Scott and his influence, there are three items on our web site to interest you: Poppyland - The Story in Words, Pictures and Music of Clement Scott's Journey to North Norfolk, a one hour documentary DVD, Poppyland in Pictures an album with accompanying text of Sidestrand, Overstrand and Cromer in Scott's time and Poppyland - Strands of Norfolk History, a booklet telling the Poppyland story. Scott was very familiar with the work of the lifeboats. They occur in a number of his writings. In The Lay of the Lifeboat verse three clearly indicates his knowledge of the lifeboats on the Norfolk coast, with its reference to the 1880 lifeboat disaster at Wells. Most of the crew drowned when the lifeboat capsized outside the harbour mouth. GENTLEMEN all, are your glasses charged? for I've a toast for the winter weather. Answer it, then, with a three times three; voice and heart, if you please together. And east winds meet the embrace of the north, our throats to scourge and muscles to harden. Away from the prowl of the burglar-sneak, and the thud of the brute who has kicked his wife. And drink to the men who are off to sea, when the sailors shout that the Lifeboat's manned. And Tom he wears a corporal's stripe, and brave little Jim the Victoria Cross. They see their flag as it waves, and hear the jolly old colonel's clear command. And it's only duty points the way when the ships break up on the harbour bar. But only women are left on shore to cry, "They're off!" when the Lifeboat's manned. Certain risk and a chance reward - this is the tale that the Lifeboat tells. What was their prize but the lives of men, those splendid fellows who died at Wells? Their lives were swallowed in waves of Fate when the men they hurried to save were free. Women they weep, as women will do ; but never a sailor quits his post. Never again will they wake to hear their comrades shout when the Lifeboat's manned. Just think a little of ships at sea, the wave's attack, and the sailor's battle. You give one sigh for the Lifeboat - yes, and you offer her crew a grain of pity. Than those who buckle the lifebelt on, when wives are left and the children kissed. To the men who go to their death at sea, and do their duty? - men can't do more. Hope departs when the land is lost; love is blown from the rocks and sand. Ready to die is the motto of men - and this is the reason the Lifeboat's manned. The next three poems we include have an obvious link through their subject matter. 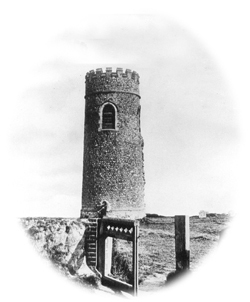 We do know that the middle of these three is specifically about the 'Garden of Sleep' at Sidestrand, the tower and graveyard that stood on the clifftop when Scott first visited in 1883; it seems reasonable that he used the inspiration of this setting for all three poems. The middle one became the best known and was set to music by Isidore de Lara. Ille terrarum mihi pr�ter omnes angulus ridet. Than other hearts have been. To dreams in worlds unseen. Our faith of long ago. Give hope that cannot cease! Under thy grasses - Peace! God planted a garden-a garden of sleep! It is there that the regal, red poppies are born! In the fields thy feet have kist. 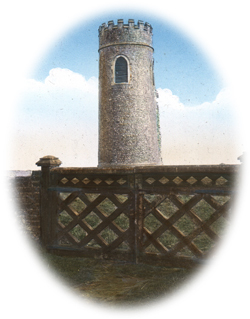 Round our Tower by the sea. And the sun of love has set. And the reaping has begun. Life and love - how unavailing! In the grass they'll bury me. We come now to some verses which are specific to Cromer and the area, both in their titles and in the verses. However, we feel that the quality of the verse takes quite a dive - "whiffs", "piffs" and "cliffs" leave a rather uncomfortable feeling as rhymes. In orthodox fashion, its annual cure. Why don't they settle their "ehs?" and "ifs,"
And come and be lazy on Cromer Cliffs? With the usual gambol of pitch-and-toss! For my morning "weed" from a box of "Finas,"
And a drink of air that has strength like wine. Is found in a hollow of Cromer Cliffs! And watch the wheat that the breezes shake. You would sleep off care on the Cromer Cliffs. They've managed to see what their friends have not. If they only could hear the "poohs" and piffs"
Of the elderly cynic on Cromer Cliffs! Were half as happy as I can be. So put in your pocket your " ahs" and "ifs,"
And come and get brown upon Cromer Cliffs! TO THE AUTHOR OF "A MIDSUMMER HOLIDAY." SING of our Poppy-land, my master, sing! Sing of our summer fields in deathless rhyme! Its tunes in triumph of recorded time! Sing of our mother, the green-girdled sea! Sing of the light that lingers on the land ! Sing of the love that was and is to be! For thou hast told of daytime and of death! Awaiting time that saith and gainsayeth. Of life, of love, of God's triumphant will! Having been somewhat "iffy" about some of the poems, we include this next as perhaps the best pf Scott's verse. It carries the air of deep emotion and avoids uncomfortable rhymes: are we reading the words of a man who has met "The Maid of the Mill" at Sidestrand? Facing pure peace, or the sands of despair! Who can wish more, or dare ask for as much? Two on the narrow gold strip of the sand. Who asks as much, or dare hunger for more? Two with the joy of the beach and the bay. Who can ask more! 0 my darling, can you ?